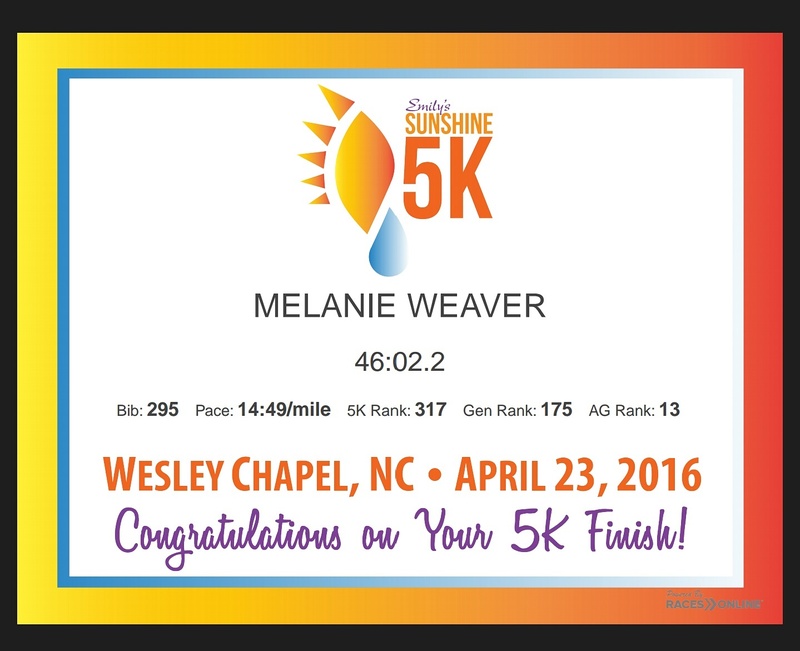 Today was the first of many 5k races we have planned for 2016. 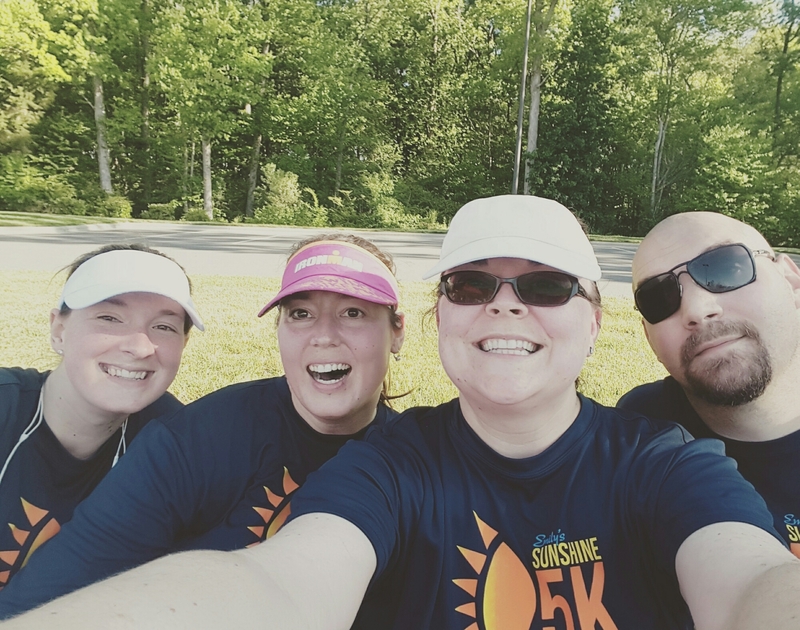 We picked the Sunshine 5K for its proximity to our house. Here we are, pre-race (you can tell because I’m still the same shade of white as my visor). I always get SO nervous on race days. We’d planned to get up at 6 am so we’d have a chance to have some coffee and let Indy roam around in the yard before we had to put her back up to leave. What ended up happening instead, though, was my waking up and noticing that it was already light outside, checking my phone, and seeing that it was actually 6:47 and we’d grossly overslept. 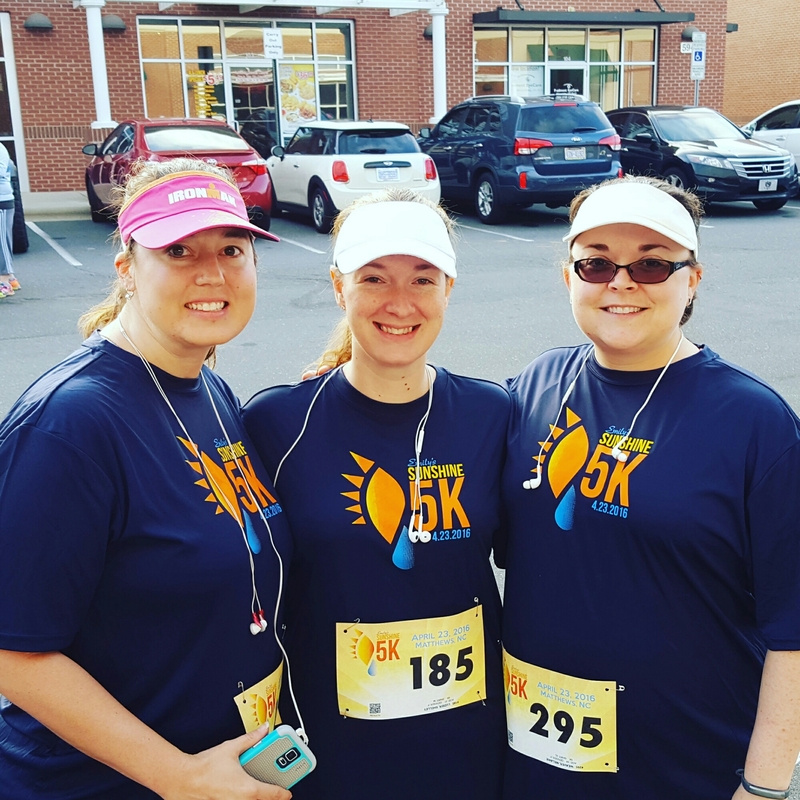 It was a good thing that the race was only five minutes from the house, so we did still have time to have a cup of coffee, and it was nice not to have to drive into downtown Charlotte to get to the venue. I was more nervous this time than I have ever been before; I knew I was going to try to run as much of the race as I could, and we didn’t have the excuse of having Indy with us this time, so I was going to have to quit punking out and just run the damn thing. I also hadn’t been able to work out Thursday because of some respiratory congestion (which I still had), so I was afraid that I’d end up coughing up a lung during the race and have to be carted away (by ambulance, of course) to the minute clinic. Thankfully, my girls were already there when we arrived; we chatted a bit–or tried to, at least, over the deafening music. They’re both much faster than I am, so I knew I wouldn’t be able to keep up with them, but I also knew they’d be waiting for me at the finish line. I’d previously told Joey to go ahead and do his own pace, but I got nervous right before it started and asked him to stay with me instead. He didn’t think twice about it. 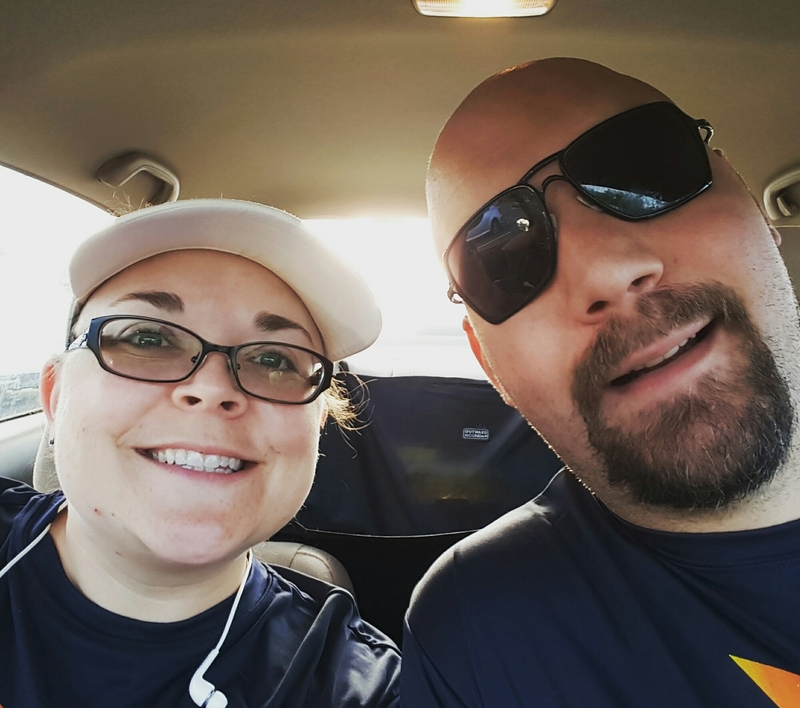 We ran most of the first mile, and I made it through my entire first song without walking, which was heartening, since we’ve been doing the Mayo Clinic 5k program, which is comprised primarily of short run/walk intervals. I had no idea how long I’d be able to sustain a run. Our first mile was about 13:30. The course was two loops through a neighborhood in Wesley Chapel; it was excellent weather and the houses were pretty. However, they looped us through a nature trail that was quite narrow and had some slippery foot bridges, which made things rather precarious for someone who’s Lupron clumsy. I’m also a little curious as to how the lady with the triple stroller managed, and how those around her felt when they were inevitably bottle-necked behind her for that entire section of the course. And we ran. And then found out that you had to circle around the back of the parking lot at the venue and pass through a gauntlet of portapotties and dumpsters before crossing the finish line. So we didn’t make it. We came close, though! My girls were there at the end, cheering for me, and then we stayed and cheered for the last finishers. I did get a race PR, even if it wasn’t quite as fast as I wanted. And I got to enjoy the best part of friendship and marriage; having people who know what I’m going through pushing me to be successful and waiting at the finish line for me. It’s hard to beat that. Incidentally, here’s my playlist for whoever may be interested. It served me pretty well. My official time was 46:02, so one minute over my goal of 45:00. All things considered, though, I’ll take it.